The new Cummins is screaming to make power! Getting the engine to breathe with a high flow exhaust system is the ticket you need to make this happen. 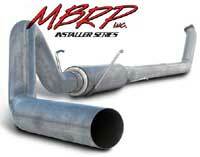 Each turbo back system is a direct bolt on application and does come with a full 4" turbo down pipe for maximum gains. The complete exhaust system consists of smooth 4" mandrel bends combined with a high flow MBRP Inc. diesel muffler to give significant improvements in the overall exhaust flow while adding horsepower, torque, improved fuel economy and lowering the EGT (exhaust gas temperature). Finish off the exhaust system with a mirror polished 5" diameter exhaust tip.